I'm off on another tangent today. This week, my amazing husband turns the BIG 3-0! That's right - October 3rd is his birthday. So, this past weekend we hosted a cocktail birthday party at our house for him, and invited our friends and family. Most of the extended family hadn't yet seen our house (which we moved into last November). So, it was a great opportunity for people to celebrate Phil's milestone and see our home at the same time. My vision for the party was simple. I wanted it elegant and chic, but not overly made-up. And I thought the best way to accomplish this was to do the decorations myself. (I'll chat about the menu in tomorrow's post). I went with black and white for a colour scheme - a timeless and elegant combo. It was also easy to decorate with it. Since the party started at 8pm, and I was sure that guests would start trickling in after that, I wanted them to feel free to enter as they wish (this helped with not having to answer the door upon every door bell ring). To do this, I made a simple outdoor sign inviting the guests to c'mon in. I made it with a simple 8"x10" canvas that I bought at the dollar store, used black and white damask and polka dot scrapbook paper to add some interest, and white card stock for the 30 logo and the sign. I then stapled a thin black ribbon to the back to hang from the door. For the door hanger, I used our Christmas wreath hanger and covered over the seasonal green with a thick white ribbon (also bought at the dollar store). Once the guests were inside, I wanted them to be met with a welcome note. I made this sign with white cardstock, scrapbook paper from Michaels (the same used on the door sign), and a mirrored photo frame. I made the template and 30 logo in a Word doc, and a little cut and paste later, I had myself a sign. Then, I just inserted it into a mirrored photo frame I found at the dollar store. 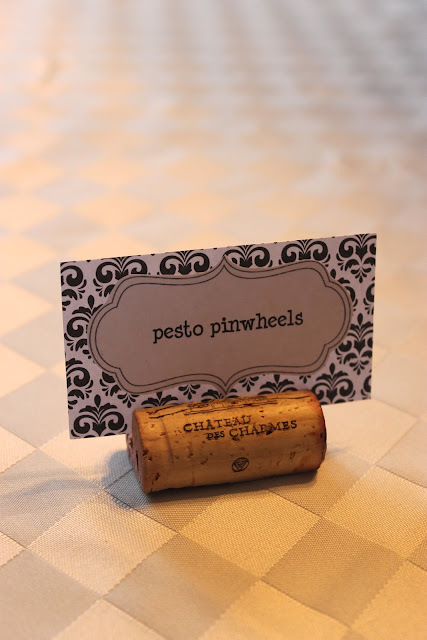 To make these signs, simply cut a slice off of the bottom of the wine cork so that it sits flat. You can do this with a sharp serrated kitchen knife. Then slice a slit in the top so that your menu card sits easily in the cork. I made my slits on an angle so that the guest can easily view the name of the item. Since we were hosting a cocktail party, my hubby wanted to serve a signature drink. Something that the majority of the guests would like, that had cost-friendly alcoholic ingredients, and was easy to make. Rather than making big batches of it in advance, we decided to let the guests make the drink themselves. After we selected the signature drink, I wanted to create a menu card for the guests to easily be able to recreate the drink. I made the menu card using the same steps that I did for the welcome note (nothing like continuity to make this lady happy). 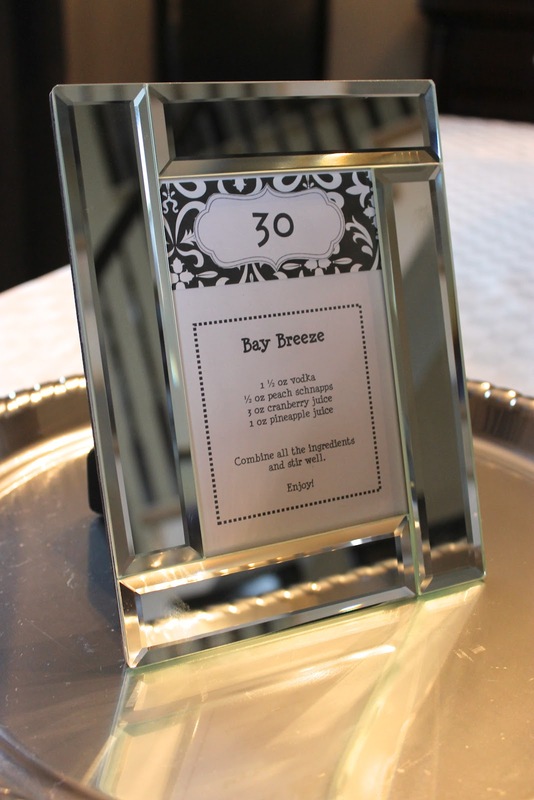 Once the menu card was done, it sat perfectly beside the signature drink area. I decided that since this was a cocktail party, a regular cake wouldn't work too well, and in keeping with the finger-food theme of the evening, I opted for cupcakes. Have you ever seen cupcake toppers around the web? I love them - so cute! And completely customizable. So I set out to DIY my own toppers. I started with the same elements as the rest of the decorations - white cardstock and scrapbook paper, and I also picked up lollipop sticks at Michaels. I simply made the circles on a Word doc, printed them on white cardstock, glued on scrapbook paper, and then taped them to the stick. 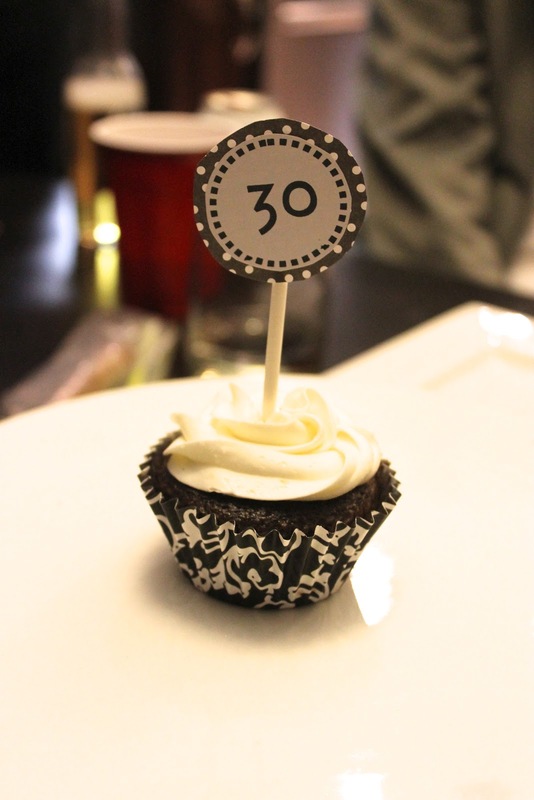 It also so happens that I found black and white damask cupcake papers that fit perfectly with the decor also. Stay tuned tomorrow, when I run down the menu for this birthday cocktail party. I'm pretty sure I had enough food to feed an army, but better to have more than not enough. Plus, no one ever complains about too much food or too big of a selection when it comes to a buffet table. Impressed with these amazing DIY cocktail party decorations. Thanks a lot for this wonderful post. I am also in need of boy baby shower themes. At some garden party Venues in San Francisco I want to host a fun shower for my sister that is expecting. Hopefully will decide on a good theme soon.